Long before there was “Lin-sanity,” there was “The Year of the Yao.” That would be Yao Ming’s rookie season with the NBA’s Houston Rockets, and the subject of the 2005 documentary of the same name. 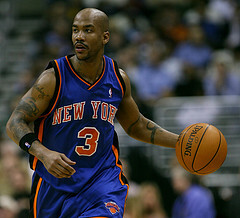 One of the players who made an appearance in the film was Stephon Marbury. Playing for the Phoenix Suns, Marbury embarrassed Yao with a crossover dribble that made Yao tangle his feet and hit the floor (at 1:09 of the trailer, here). That was a while ago, and now, both players are no longer in the NBA. Yao has retired due to injuries, and Marbury, in an ironic twist, is now playing for the Chinese Basketball Association’s Beijing Ducks. Not only is he playing, but he just led his team to win the 2012 championship. While playing in the US, Marbury was known for his philanthropy, but he also had a reputation for being selfish and hard to get along with. In fact, Sports Illustrated once named him the “most undesirable teammate” in the NBA. But according to China’s Economic Observer, things are different in China, where Marbury’s image has only an upside. During the 2005-06 season, reporters at the Daily News called Marbury, then a member of the New York Knicks, “the most reviled athlete in New York.” But now, in 2012, the people of China call him by the respectful title zheng wei, meaning political commissar. For his fans, not only is he a great player leading them to victory, he is also someone who never disappoints them. No matter how long the queue is, he signs every notebook handed to him. . . . He also talks with the old Chinese ladies in his neighborhood, makes Chinese tea for journalists, has learned to use chopsticks and speak Chinese, and he even takes the crowded subway. It’s just something about the serenity and peace of the country. I can’t really explain it; you’ve got to experience it. I spoke with J. R. and I told him to make himself completely vulnerable to love: embrace the culture. You’ve got to acclimate yourself to something different, you’ve got to grow into it—and then you get this stillness and calmness about yourself. And what are the future plans for the political commissar? It ain’t temporary, it’s for good. I’m going to stay here, I’m going to live here. I love it here. If you’d like to see a great film about adjusting to a new culture, I recommend The Year of the Yao. Not only did the 7-foot-6-inch Houston Rockets’ center enter the US, he also stepped into the unique world of the NBA, carrying the hopes and dreams of an entire nation with him. The documentary is also a look into the life of his young translator, himself a “rookie” thrown into the mix. You are currently reading Stephon Marbury, China’s “Political Commissar” at Clearing Customs.